Winter is when most horses will start wearing their heavy turnout rugs, as the majority of those in work will be clipped. If you’re not exercising your horse over the winter months, you probably won’t need to rug him as his thick natural coat will insulate him from the elements. There are many reasons why rugging is necessary for some horses, such as their age, health and the type of work they do. 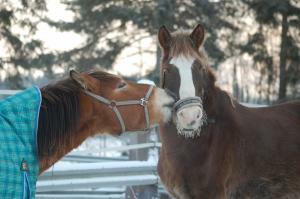 Old and underweight horses are more vulnerable and may find it harder to regulate their body temperatures in the cold. In the wild, horses would have had ample space to roam and find shelter, whereas fields are much smaller for today’s domestic horses and often have little cover to protect them from the weather. If your horse is clipped, a rug will definitely be necessary during winter as his natural insulation has been lost. Horses that are worked but not clipped are going to sweat more, which in turn means they’ll take longer to dry off. If a horse is turned out after exercise without having dried off, he is more likely to catch a chill. On the other hand, if your horse isn’t going to be worked through winter then leaving him to grow a thick coat is enough, providing he is well fed and has shelter. An unclipped coat traps a layer of heat close to the body, creating a very effective insulating effect. If you do rug your horse, you need to ensure it is thick enough to compensate for this natural effect, as thin rugs flatten the hair and can make a horse colder than it would be without one. Whatever you decide to do, it can be difficult knowing when a rug is necessary, and what type of rug (and thickness) to go for. Below is a simple table outlining the temperature cut-off points and the suitability of certain rug types based on whether your horse is clipped or not. If you have any thoughts on this discussion or advice for our other readers, please comment here or email me directly: [email protected] Please get in touch if you need any advice on choosing a suitable winter rug. Does rugging too early mean their natural coats don't develop so well? The warmer your horse is, the less of a coat he grows. So if you want your horse to grow a long coat, don't rug him, or only use a lightweight turnout. I also learned for horses unclipped but finer like Arabians to wait until a good winter coat grows and weather down to about 5c before rugging and then start with a lght rain sheet. My more elderly Purebred Arabian with currently controlled Cushings on 2 Prascend a day will be kept dry and then warm in the winter but I will try to wait until at least mid November if I can. I am a very proud owner of two beautiful, characistic Shetland ponies 7& 9. Having read up over the past 6 months about Shetland ponies. I felt confident as a first time owner of my ponies. Never had horses that I would do the very best by them. They have a very good shelter well balanced diet and hay. Fed up being asked if why Iâm not rugging them. Iâm confident they are warm under there withers, they feel like bears! Is it right for them not to tug them this week ? A very balanced well written article, thankyou for confirming my thoughts on rugging.